On April 30th the real work began. The load for each of the Tibetans, that consisted of men, women and boys, was 40lbs. Geoffrey Bruce was in charge of operations and tried to make it so the women and boys got the lightest loads but soon found that this was contrary to the custom. The Tibetan way was simpler and to them more satisfactory. Each took a brightly and individually recognisable woven garter from the top of their boot. The distributor of the loads collected the garters and placed these randomly, one on each load. The owner would collect their garter and load without complaint. Norton’s intention was to make the first summit attempt on May 17th. However, during the intervening period Camps I, II and III on the glacier had to be established and stocked and the route up to the North Col where Camp IV was to be established had to be determined. From there the higher camps had to be fixed, Camp V at 25,500ft, Camp VI 26,500 ft and finally Camp VII at about 27,200 ft. All this had to be done before any summit attempt could be made. The hardest of the work ahead would fall to the porters brought from Darjeeling. To save their strength as much as possible the Tibetans that Norton had enlisted were used for establishing and supplying the first two camps on the glacier. For this they were paid one shilling a day plus rations. They were not employed to work on snow or ice and had to be released promptly after their duties so they could return to sow their fields. These Tibetans were not supplied tents and were apparently prepared to sleep out in the open at 18,000ft. 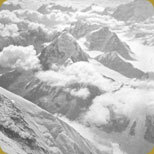 From Camp 1 seventy–five Tibetans were sent back to Base Camp, of which fifty two disappeared without reason placing a greater burden on the Expedition. The other seventy five were used to establish and stock Camp II. Over the next week while moving up and setting up Camp III the Expedition suffered terrible weather and fiercely cold conditions that took a significant toll on the climbers. Orders came to retreat back to Base Camp. 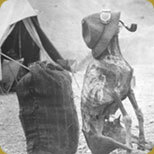 Somervell was busy looking after the sick at Camp I, the most severe were Shamsher one of the Gurka N.C.O’s who was suffering from a blood clot on the brain and Manbahadur, a cobbler, who had terrible frostbite up to the ankles. Both men died in the following few days. On May 15th the whole Expedition, climbers, Gurkas and porters proceeded down to the Rongbuk Monastery to ask for the blessing of the Lama. With the spirit of the porters properly restored the Expedition could progress. As if a sign from God the weather the next day was clear without a cloud in the sky. By May 19th Norton, Somervell, Mallory and Odell were in Camp III, Irvine and Hazard in Camp II, Noel and Geoffrey Bruce in Camp I, Beetham and Hingston at Base Camp. On May 20th Norton, Mallory and Odell and a laden porter reached the North Col. On the descent back to Camp III Norton had a nasty slip and the porter was only saved from fatal consequences by a soft patch of snow. Mallory, unseen by the others, stepped into an obvious crevasse, falling about ten feet down before his ice axe fortunately jammed across the crevasse suspending him above a black abyss. Slowly and with great effort he managed to extricate himself from this deadly position. After the ascent of the North Col by Norton, Mallory and Odell the task of actually establishing Camp IV fell to Somervell, Hazard and Irvine. According to plan they, along with twelve porters carrying tents, stoves and provisions, climbed up to the North Col on the 21st of May. 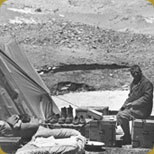 The day proved to be both difficult and gruelling but by the end of it saw Hazard and the twelve porters on the North Col to establish Camp IV and Somervell and Irvine exhausted but safely returned to Camp III. 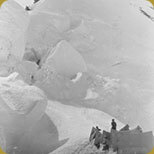 The plan had been for Odell and Geoffrey Bruce to follow up on the 22nd of May, sleep that night at Camp IV then continue on the next day with the twelve porters to establish Camp V. However, snow fell that night and throughout the 23rd until 8pm followed by a large drop in the temperature. May 23rd was a fine windless day. Geoffrey Bruce, Odell and seventeen porters proceeded up towards the North Col, but on seeing Hazard and the porters descending, retreated back to Camp III. Hazard arrived back at Camp III with only eight porters. He had headed down first to test the new snow conditions. The last four porters had turned back and were now stranded on the North Col. The snow began falling again, further increasing the risk of climbing either up or down. Through the night the snowing stopped and early the next morning Norton, Somervell and Mallory set off to rescue the stricken porters. It was an epic day, but by 7.30pm that evening they were leaving the lower ice slopes of the North Col with all four porters safely rescued (although one had severely frostbitten hands) arriving back at Camp III in darkness. The physical toll on these three important climbers was tangible and the whole Expedition had once again to retreat back to Base Camp to rest. Out of the original fifty-five porters from Darjeeling only fifteen could now be counted on, these fifteen became know as the ’Tigers’.